Marketing is a world I obviously don’t understand. Let’s say you were looking to take on a fairly big entry-level beer label. Lets say it’s James Squire, because, well, that’s who it is. If I’m doing that, I’m going to create a very distinct image – in terms of the name, the packaging and even the beer. I’d be trying to make beer that was a step above where James Squire is – a beer that wasn’t supremely challenging but very tasty and moreish. But I’ve come to the conclusion that I have no idea of how the beer world works. 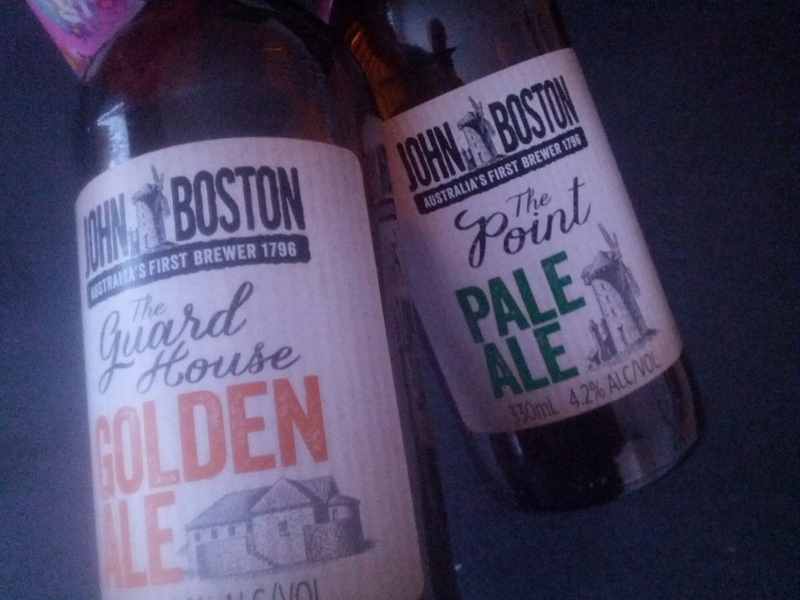 And the John Boston beers pictured above are an example of that. For those not in the know, the actual real people (and not the beer labels that appropriated their names) John Boston and Squire both have some claim to the title of Australia’s first brewer. The historical records are a bit sketchy, because people were too busy trying to carve a colony out of the bush to worry about who made beer first. The Wine Society had a crack with the John Boston name, but really didn’t make any inroads. A year ago, it seems they sold the name to Pinnacle Drinks, which has relaunched the brand with new beers, new packaging and everything else. That’s the sort of thing you can do when you’re owned by Woolworths (though you won’t find that info on the label). So you can prepare to see great big John Boston displays at Dan Murphys, BWS and whatever other bottle shops Woolworths own. Firstly, I found it odd that Woolies would buy the John Boston brand. For two reasons; firstly, it hadn’t really set the world on fire last time and, secondly, using a colonial brewer as your figurehead is just likely to cause people to confuse your brand with James Squire. Unless, of course, that’s exactly what you’re aiming to do. Take a look at the labels in the photo. Don’t they have a passing resemblance to Squire labels? To me, that beige-pale yellow backing colour looks quite similar to the one Squire uses, as does the use of different colours. And the tag ‘‘Australia’s first brewer’’ – surely that’s going to cause people to think ‘‘James Squire’’. As for the beers themselves – the Guard House golden ale and The Point pale ale are both pretty tame. Nothing much wrong with them technically, but for someone who likes a bit of flavour, they’re quite lacking. Quite similar to the equivalent James Squire beers (though I will say I’d pick JS’ One-Fifty Lashes over The Point any day of the week). Looking at the beers and tasting them makes me think the whole idea is to resemble James Squire. That way James Squire drinkers may go into a bottle shop and pick up a six-pack of John Boston by mistake because they look the same. Maybe they’re looking to encroach onto an existing market and demand, rather than creating their own. Seems a weird way of going about things to me. But, like I said, I’m clearly no genius in this area. They do look exactly like Squire labels… even the names are reminiscent of James Squire. I reckon it’s just lazy marketing – look at something like Masters (the competition to Bunnings) – whenever I see a masters ad on TV, I think I’m watching a Bunnings ad until the very end. So what does their ad do? Make me think of Bunnings! Anyway, before this turns into an essay, unfortunately the success of a beer comes down to how well it’s marketed, not how good it is. If it were opposite, we wouldn’t have macro lagers in the first place. Copy-cat marketing will always make a brand look like #2, so they’ll always be number 2. If they want to be a “challenger brand” they need to find something that sets them apart, not the same! Bought a case of both PALE and GOLDEN ALES,($45 each),on the recommendation of a Dan Murphy’s employee. James Squires have no fear.This is a PALE imitation of your product “50 Lashes”.Very light on flavour. Haven’t tried the GOLDEN ALE yet.Will inflict it on my party guests and ask their opinion. Along with Steamrail (Coles) and Sail & Anchor (another Woolies) this makes three beers on the market trying their hardest to look like genuine, lovingly crafted boutique beers when, in reality, they’re homebrand Black & Gold supermarket megaswill. Won’t be long now before enthusiastic consumers wanting to try out the ‘craft revolution’ will be purchasing so much of this kind of product that genuine ‘Mum and Pop’ breweries start to go under. Sad, disgusting state of affairs. Yes, might look the same as Squires but certainly doesn’t taste like it. I brew my own unless I’m too lazy (quite often) and i find the squires range is a reasonable substitute. This on the other hand is watery and underhopped. Mimicking Squires labels is a good ploy, because they certainly will not make sales on the beers own merits. I don’t mind some of the Squire beers for when I want a beer I don’t need to think about. But I don’t reckon I’ll be drinking any of the John Boston efforts again. We bought a case of John Boston Golden Ale tonight because it was $15 cheaper than the James Squires Golden Ale we were planning to buy, and the Dan Murphy’s staff had conveniently positioned them side by side. We won’t be buying them again! Initial taste is ok, but after a few beers you really know you are drinking some awful VB equivalent, masquerading as a craft beer. Before we even looked online we knew this beer was owned by Woolworths. People who drink beer for the flavour, and to not enjoy a mad hangover, will buy this crap once or twice and that will be it. Unfortunately drinkers of VB, Carlton etc. will think they’ve discovered an amazingly cheap boutique beer and will buy this stuff by the boatload. The marketing is sneaky, and that is exactly the point. Compare the labels side by side, and you can see what they are about. Don’t buy it. It’s rubbish. I generally don’t buy it unless its on tap, because they aren’t really craft any more in my mind. They are flavorsome, but they are still mass produced product from Lion/Kirin. I would much rather support some one like Hawthorn Brewery. Wow you are spot on it looks very similar to James Squire… I’ve come across this blog AFTER purchasing a case of the John Boston Golden Ale for our work christmas party, and I don’t think I can return them now… hmm will see what the rest of the office thinks when they try them – cheap imitation or not!? Well done boys. I live 45 minutes from the town where Dan Murphy’s is. 39 degree day, needed beer. Looked through the assortment and little impressed. Thought I would try this “new” John Boston. Got halfway home staring at the box next to me and knew it was a Woolworths rippoff. $45 vs $58 for Squire. I work for a winery, and they do exactly the same. If you see a wine label that looks like Penfold’s in colour, style, font, the works, but is not Penfolds, bet your last buck it’s Woolworths inferior product!